A “Donkey Kong” arcade cabinet. The high-score limit was calculated by Jeremy Young, the resident stats guru of DonkeyKongForum.com, the online home of dedicated Donkey-otes forever tilting at high-score windmills. Young, who works as a freelance music arranger in Japan, spends hours a day in the forum, creating scoring charts for any member who submits his game for review. Together with fellow “Donkey Kong” data analyst Scott Cunningham, he’s been analyzing the strategies and pace of the world’s best players, and has realized that there simply isn’t much room left between the current high score and the maximum one. While “Donkey Kong” is a relatively simple game of running and jumping (and occasionally smashing) whose board layouts start to repeat after level four, there’s no fixed number of points you can score in a game; a random number generator determines the value of many of the prizes you encounter and the path some of the obstacles take. But the game does crap out due to a malfunction on the start of level 22 — the infamous kill screen — making it possible to figure out the maximum number of points possible. Young has calculated that a player using optimal strategy and getting as many lucky breaks as possible would score 1,265,000 points. Saglio is 95.4 percent of the way there. The elite Donkey-otes trying to close the rest of the gap are an eclectic group. Gen Xers, nostalgic for the days they whiled away in arcades as teenagers, mix with a younger crew who stumbled into the game and then got hooked. The most recent record holders are a plastic surgeon and a golf club valet. The two things they have in common are that they all got serious about playing after watching “The King of Kong: A Fistful of Quarters” and that they are all willing to spend countless hours collaborating with one another online. Now, when Saglio plays — often late at night, when his wife and two young kids are asleep — he’s often joined by five to 10 other Donkey Kong Forum members who watch him play on game live-streaming service Twitch and share inside jokes with one another as he progresses through the game. When he pulls off a particularly risky maneuver, the chat box fills with multiple Kreygasm emojis, the Twitch-approved symbol for gamer elation. Even though he’d have to successfully smash another 96 barrels to surpass Saglio’s score, Lakeman earned his record on an actual arcade cabinet, not an emulator,1 and thus his score is considered to be most legit. (It was the same machine Wiebe played in “The King of Kong.”) Although the software is identical in the emulator and the arcade, a keyboard is considered slightly more responsive than a joystick, and being able to sit in a comfy chair for the three-plus hours it takes to play a complete game on an emulator is considered easier than leaning over from a stool at an arcade. By studying the moves that emulator users are able to make that cabinet users can’t, Cunningham estimates that a keyboard gives Saglio about 10,000 extra points a game. Cunningham, the other half of the data analyst duo on Donkey Kong Forum, meticulously measures the point-pressing systems of Saglio, Lakeman and other top players. For all his analysis, though, he’s also a romantic. He describes his renewed relationship with the game after watching “The King of Kong” as akin to rekindling a romance with an old flame and then taking it to the next level. Last year, at 56, Cunningham became the oldest person to make his Mario spin — which is what happens when a player reaches the end of the game. “Some guys are proudest of their families,” he says. “For me, it’s kill screening ‘Donkey Kong’ in my late 50s.” He’s also tackling an even more ambitious project: Since May of 2013, he’s been creating a library of important games, breaking them down by the scores on boards and levels and calculating the overall scoring pace throughout the game. While he’s found that average scores are ever-so-gradually rising on all types of boards (barrels, elevators, rivets and conveyors), he’s also convinced himself that there are no new revolutionary strategies to discover. There’s no player out there routinely outscoring everyone on conveyor levels, for example, and no new point-scoring glitch to exploit by jumping up and down next to Kong that hasn’t been discovered. The final points to be gathered on the road of ever-diminishing returns are simply going to be ground from a combination of risk-taking, patience and above all, luck. 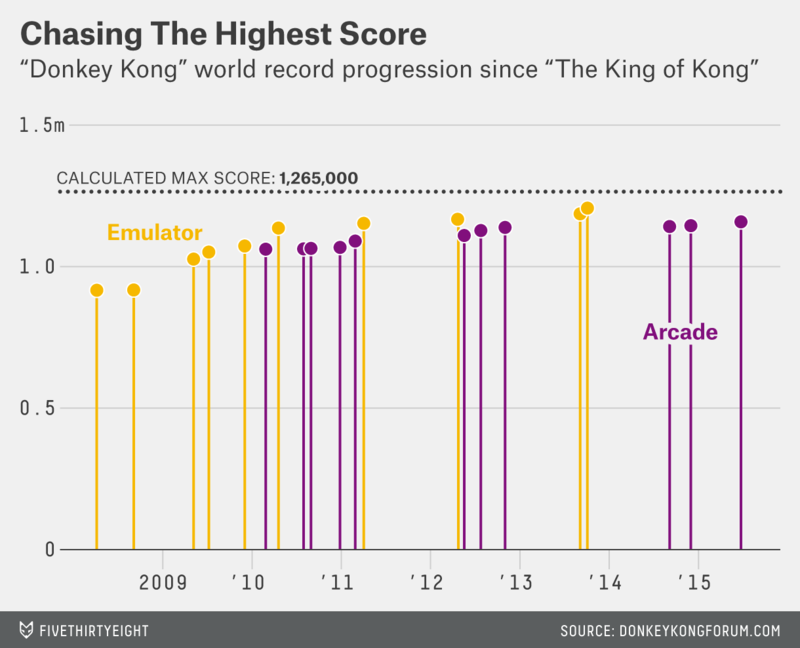 Someday, in the not-too-distant future, Saglio may be blessed by the random number generator within “Donkey Kong” — perhaps with rivet boards full of 800-point fireballs to smash — and he’ll move his high score ever closer to the max. A chorus of Kreygasms will rain down from his friends in the “Donkey Kong” community. Most elite “Donkey Kong” players train using a computer application know as Multiple Arcade Machine Emulator (MAME), which lets users play any of thousands of classic arcade games at home.